Spinal cord injury (SCI) is a medically complex and life-disrupting condition that carries a high risk of morbidity and mortality. The major cause for the SCI is reported as trauma. Many of the high-prevalence causes of traumatic SCI include fall from height, sporting and leisure injuries, road traffic accident, and congenital problems. Every year, around the world, between 250,000 and 500,000 people suffer SCI with an estimated annual global incidence of 40–80 cases per million population. Prevention of secondary complications and promotion of a healthy lifestyle are the major goals for the population with SCI. Recent emphasis has been on the prevention of diseases common in the general population, which includes noncommunicable diseases like diabetes, cardiovascular disease in addition to those specific to SCI. In SCI patients, the combination of dry mouth from xerostomia-causing medications, barriers to dental care access upper-limb weakness and impaired mobility causes poor hand function to perform oral hygiene, impaired manual dexterity, dependence on others for oral hygiene which may adversely affect their oral health, thereby significantly increasing the risk of oral health problems, such as dental caries and periodontal disease. The problems of access to dental care encountered by persons with SCI are similar to those for nondisabled individuals but are compounded by physical barriers, limited transportation, lack of dentists specializing in oral health needs of this population, and limited knowledge of oral health issues faced by persons with SCI. Hence, high cost, dental fear or anxiety, and physical barriers are the three major obstacles to community-dwelling adults with SCI in obtaining regular dental care services. Policy changes that ensure prompt and effective medical response and sustained rehabilitation toward full reintegration into community life are highly cost-effective and socially beneficial. The cost of providing immediate emergency and medical care is offset by the fact that this care directly saves lives. Since SCI disproportionately affects younger people with many productive years remaining, failure to allocate resources to their rehabilitation results in a substantial social waste that can be avoided through cost-effective measures. Expenditure on the medical and rehabilitative responses to SCI is money well spent. More importantly, saving lives, promoting the quality of life (QoL), and retaining productivity are social and humanitarian imperatives. It can bring about large improvements in the health and QoL of people with SCI. With this background, the aim of the present study is to assess the association between oral health status and oral health-related QoL (OHRQoL) in participants with various levels of SCIs. This cross-sectional study was conducted to assess the association between oral health status and OHRQoL among SCI patients in Chennai city. Ethical clearance was obtained from the Institutional Review Board of Ragas Dental College before the commencement of the study. The study was conducted among 55 SCI patients between the period of November 2017 and March 2018 in the rehabilitation center located at Chennai. Spinal injury was confirmed using the American Spinal Injury Association impairment scale. Based on this scale, complete injury was the term used to describe those individuals where all the sensory and motor function were lost below the level of SCI, and incomplete injury was described as loss of some motor or sensory function below the affected area. Convenience sampling was done, and all the participants who gave verbal consent were included in the study. All the participants with various levels of SCIs and undergoing treatment for the past 1 year were included in the study and those who were unwilling to participate were excluded from the study. Before the commencement of study, the examiner was standardized and calibrated to ensure uniform clarifications, understanding, and presentation of the codes and criteria for the conditions to be observed for warranting steady examination. The questionnaire was administrated by the single interviewers to the participants through face-to-face interviews method. All the questionnaires were in English, and during the time of administration, if required the interviewer translated the questionnaire into local vernacular for ease of understanding. In addition, data pertaining to the demographic details and socioeconomic status were also recorded through the Modified Kuppuswamy scale, 2016. The oral health status of the participants was recorded using the World Health Organization (WHO) Oral Health Recording Pro forma, 2013 by the same examiner. The examination was made with the aid of a mouth mirror and Community Periodontal Index probe according to type III examination as described by the WHO. Data on OHRQoL were assessed using other shorter version of Oral Health Impact Profile (OHIP-14) which consisted of 14 items that explored seven domains. The participants responded to each item according to the frequency of impact on a five-point Likert scale ranging from never to very often. The data collected was compiled using Microsoft Office Excel and was subjected to the statistical analysis using the IBM Corp Statistical Package for the Social Sciences, version 20.0. NY, USA. Descriptive statistics included computation of percentages, means, and standard deviations. Wilcoxon-signed ranks test was used to find the association between mean OHIP and Oral health status (decayed, missing, and filled teeth [DMFT], gingival bleeding, and periodontal pocket) of study participants. The present study was conducted to assess the oral health status and OHRQoL among SCI patients in Chennai city. For all the study participants, assessment of oral examination was done in their best comfortable position. In addition, many patients were on complete bed rest and hence could not be moved to the dental setup for examination. The majority of the patients examined were male. Mukherjee reported that the highest number of SCI happens among males in the age group of 15–59 years. In this population, the highest percentage of the DMFT component was attributable to the decayed teeth. This indicates unmet need and infrequent visits of this population to the dentist. Shah et al. also stated that health-care utilization is influenced by several socioeconomic and psychological factors such as financial status, education level, economic dependence, family and marital status, physical and mental fitness to seek care, and availability/access to care. These individuals are unable to clean their teeth adequately due to their physical affliction, which was in line with our study findings. The mean gingival bleeding and periodontal pocket score were found to be significantly higher than the normal population. Jain et al. also stated that periodontal disease is the major cause of the tooth loss in Indian adults. He reported that there was an increase in periodontal disease with decline in mouth cleansing habit, decrease in educational status, and decrease in socioeconomic status of the people. 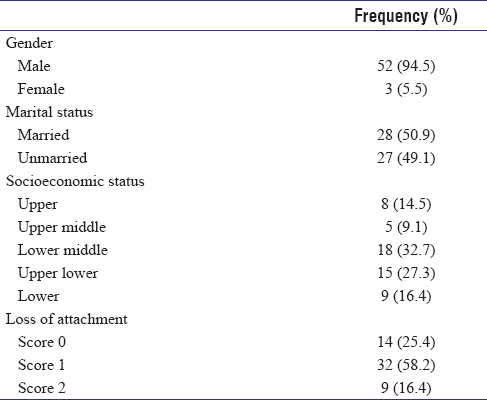 In this study, OHIP 14 questionnaire was used to assess the OHRQoL in SCI patients. The mean OHIP for SCI patients was calculated as 16.22. In incomplete level injury patients, many of the participants responded as “hardly ever” for the domain of “functional limitation” (51.1%). A similar study done by Pakpour et al. also stated that mean OHIP score for SCI patients was 19.9. QoL is a subjective measure and is multidimensional; various factors that influence the perception of QoL in patients with SCI are mobility, mental health, employment, accessibility of social environment, social support, and also coping. Similarly, OHRQoL also depends on several biological, social, psychological, and cultural and contextual factors. Age was the only sociodemographic variable associated with OHRQoL. As the individuals become older, the burden of oral disease gets accumulated which might be the rationale for older participants perceiving greater impact of oral health on their QoL. All the oral findings had a significant negative effect on OHRQoL. Participants with dry mouth, increase DMFT scores, gingival bleeding, and periodontal pockets reported poor OHRQoL. It is evident that the clinical oral health status is significantly related to OHRQoL. Prevention of oral problems is the most important factor in the care of persons with disabilities. Prevention involves increasing personal and caregiver knowledge, regular professional oral health care, plaque control measures, and healthy diet. Many aids have become available to help prevent dental disease, such as mouth rinses (alcohol-free), electric toothbrushes, and swabs. The results of this study suggest that active measures should be introduced and promoted among the people with SCI and caregivers. The limitations of this study are inherent to its exploratory nature and cross-sectional design. The smaller sample size and the recruited convenience sample are prone to sample bias. The generalization of findings is further limited by the mixed urban and rural study settings and may not adequately reflect other areas. Oral health appears to be compromised in people with SCI, which suggests the need to focus more attention to the provision of adequate dental and periodontal care to this population. The findings of this study demonstrate that there was a significant association between the oral health status and OHRQoL. It is extremely important that paraplegics and quadriplegics carry on a meticulous daily oral hygiene program. Maintenance of optimum oral health is of prime concern to the person with limited or no finger or arm movements, since the teeth are now also being used to perform many other functions. The proper maintenance of proper masticatory mechanism contributes greatly to good health and is an integral part of the rehabilitation of the patient with an SCI. It is recommended that an oral care project should be programmed for residents of SCI as a long-term initiative and evaluated at the appropriate time. Education for patients, relatives, and the staff on oral health-care issues should be encouraged and facilitated. Staff should be consulted and empowered on issues involving the oral health of patients. The dental service to SCI should be maintained and planned to the needs of patients. The barriers experienced by staff when cleaning patients' teeth/dentures should be addressed with the help of practical demonstrations and support from the dentist and senior nursing staff. The consumption of cariogenic foods and beverages should not be encouraged for patients, and tooth-friendly snacks should be readily available in the units. Hagen EM. How to prevent early mortality due to spinal cord injuries? New evidence and update. Indian J Med Res 2014;140:5-7. McColl MA, Gupta S, Smith K, McColl A. Promoting long-term health among people with spinal cord injury: What's new? Int J Environ Res Public Health 2017;14. pii: E1520. Stiefel DJ, Truelove EL, Persson RS, Chin MM, Mandel LS. A comparison of oral health in spinal cord injury and other disability groups. Spec Care Dentist 1993;13:229-35. World Health Organization. International Perspectives on Spinal Cord Injury. Mukonos city, Greece: ISCOS-International Spinal Cord Society; 2013. Khattar V. Oral health needs assessment of adults with spinal cord injuries resident in an institution. Indian J Public Health Dent 2009:7:30-6. Mukherjee AK, editor. Spine Injury and Disability Care. 1st ed., Ch. 1, 2. New Delhi: Vikas Publisging House Pvt., Ltd.; 1999. p. 2-9. Shah N, Parkash H, Sunderam KR. Edentulousness, denture wear and denture needs of Indian elderly – A community-based study. J Oral Rehabil 2004;31:467-76. Jain D, Sen V, Jain TP. Epidemiological study of periodontal diseases in rural areas. Indian J Med Res 1981;73:577-83.